Before you get started shelling peas, it’s important you do it at the right time. You want to make sure to pick your homegrown peas when they are young and shell them right after you pick them. 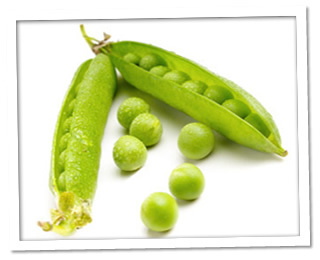 If peas stay on the vine or in your refrigerator for too long, their sweet sugar will turn into starch. Peas that aren’t shelled right away are hard, fibrous and have a lot less flavor. For the freshest and sweetest flavor, picking and shelling peas should be done in quick succession. I like to sit on a little stool right next to my pea plant so I can shell as I pick. You’ll want to bring a colander and two big bowls with you, one for the peas and one for the empty shells. You might also want to bring a friend or a radio, because pea shelling can take awhile. Make sure to drag your garden hose over to your pea shelling station before you start. Pick enough peas to fill your colander and then rinse them thoroughly to get rid of any dirt on the outside. That way your bowl of freshly shelled peas won’t have any dirt mixed into it. After those peas are clean and the water is all drained, you’re ready to shell your first batch of peas. Holding each pea with the curve facing up, snap the end off and pull down to remove the strip from the middle of the hull. Then, you can pry open the pea by pressing down in the middle with your thumbs. When the shell is opened, pop the peas out with your fingers and let them fall into your bowl. Toss the empty shell into your second bowl and you’re on your way. If you are knowledgeable enough to own an electric mini sheller, your pea-shelling day will become a whole lot shorter. Using a mini sheller will only take a fraction of the time it takes to shell peas by hand. Although I always recommend shelling peas right after you pick them, you won’t need to shell right next to your plant. With a mini sheller, you can afford the time it takes to pick all of your peas and carry them inside to be shelled. Pick all of the peas you want to shell for the day and rinse them off in your kitchen sink. After they dry out for a few minutes, bring your peas over to the mini sheller and just start feeding them in about four at a time. The shelling process happens so fast, you won’t have any downtime. As fast as you can feed your peas into the machine is as fast as it will shell them. The greatest thing about using the mini sheller instead of shelling peas by hand is the time it saves. With the mini sheller, most of your time will be spent picking your peas. The actual shelling will only take a few minutes. When shelling by hand, picking your peas will be the shortest part of your day and the actual shelling could take you hours. Another reason to use an electric mini sheller is that it can quickly shell any type of pea. Some varieties of peas are a lot harder to pry open by hand and can tack on hours to your pea-shelling day. I know it’s taken me many hours trying to get all of my black-eyed peas shelled by hand before suppertime. For people with a big garden and a lot of plant varieties, a mini sheller can really make shelling peas easier. The last thing you need to know about shelling peas is what to do with them after they are shelled. Try to plan your pea shelling before a mealtime and have your other ingredients ready to go. If you can’t eat all of your freshly shelled peas right away, store them in the freezer. Freezing peas rather than refrigerating them will help to retain a lot more of that delicious flavor. Check out some of our excellent recipes and ideas for preparation in our Blog.